Last summer, Nathan Moomaw recruited customers for his new pastured based meat farm, Moomaw Family Farm, before owning a single animal. Because he lacked actual images of the yet-to-be-purchased animals, he included illustrations of pigs, sheep, rabbits, and chickens on his website and brochure. He set up tables at different Portland area farmers’ markets and chatted with anyone who approached him about his new meat CSA. It’s a testament to the nationwide market gap in traceable pastured meats, to Nathan’s appealing business plan (with options for a full or half share, home delivery, and a variety of cuts from four different heritage animals), and maybe even to those cute illustrations, but by the time Nathan was ready to start rearing animals, he had a full roster of eager members – 104 in total – who’d signed up for a year’s worth of monthly meat deliveries. I visited with Nathan on a brilliantly sunny day in early October, two months into the official CSA season, and witnessed firsthand the rapid transition from illustrated brochure to viable business. As I wandered around a farm full of grazing sheep, rooting pigs, squawking chickens, and nibbling rabbits, and noted the accompanying freezers flush with meat, Nathan shared that he’s quickly moved past the recruiting stage, and now needs to hold potential customers at bay. His waiting list grows larger each month, with Nathan estimating that there’s currently nearly 60 hopeful members. 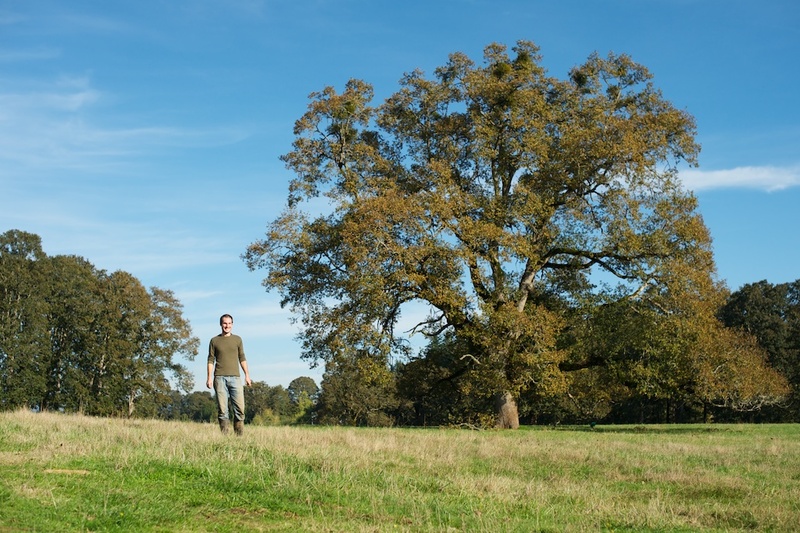 Nathan raises his animals on Drizzlewood Farm, a seriously stunning piece of land set into Mollala’s rolling hills across from a large Christmas tree farm. Nathan found Drizzlewood Farm through iFarm, a system run by Friends of Family Farmers that connects farmers seeking land with landowners (or even existing farmers) seeking farmers. Drizzlewood’s farmers Harlan Shober and Kathy Thurow understand the intricacies of pasture based animal production: instead of a standard lease where a farmer might rent a portion of the land, Nathan rents per animal, which leaves the entire property at his disposal, giving him freedom to move the animals as necessary. In fact, the great majority of Nathan’s day involves moving these animals around the property and ensuring they’re healthy, well-fed and watered. 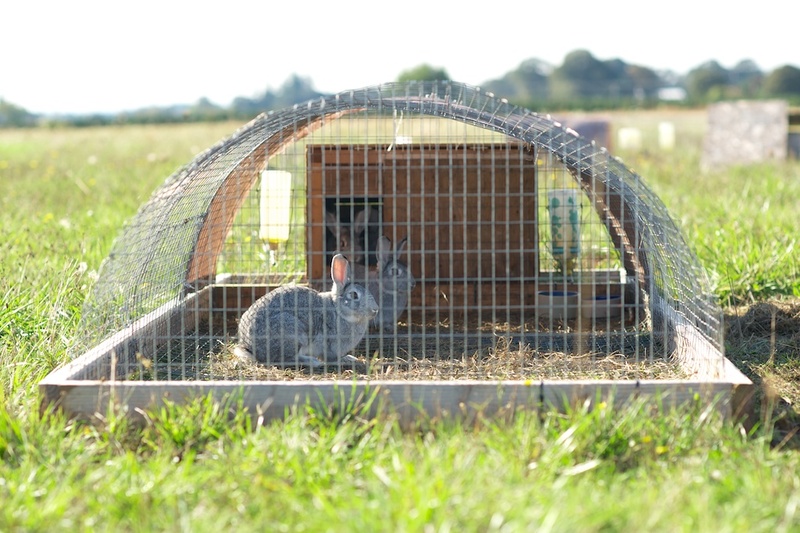 He relocates the chinchilla rabbit hutches daily, the evidence of their appetites apparent in the nibbled down section of rectangular grass next to where they peek out. Nathan rotates the fences around the other animals – Red Ranger chickens, Katahdin sheep, and Tamworth pigs, along with several that are crosses of a few breeds – as necessary. Nathan didn’t stumble into raising pasture based meats for an eager Portland audience by accident. Originally from Portland, Nathan spent ten years working various agriculture jobs in the Midwest, from alpaca farmer to market manager, which ultimately led him to an “if you build it, they will come” epiphany. In explaining the rapidly positive response to Moomaw Farm, Nathan reflects, “I think I just picked the right fit. I had a pretty good sense of what was available and what people wanted [and] it seems like there’s a huge lack of sustainable meat.” In Wisconsin, as the manager of the Riverwest Gardeners’ Market, Nathan fielded numerous calls from vegetable farmers seeking a market stall, yet couldn’t find anyone to sell meat at the market. “When I’d go looking for [sustainable meat producers], they’d say no. They didn’t need more markets because they were having no trouble selling their meat,” Nathan elaborated. Nathan’s early success at Moomaw Family Farm demonstrates the gap between the supply of pastured meat, and the overwhelming customer demand for that product. Wondering how such a market abnormality came about, and how to bridge the gap in demand, invites a comparison to the “nature versus nurture” debate. For centuries, philosophers and psychologists have ascribed certain behavior patterns or characteristics (hard-headedness or empathy, for example) as inborn to a person, no matter the circumstances, while others have believed that knowledge and behavior patterns stem from experiences. Today, we recognize it’s neither nature nor nurture alone, but rather a sensitive mix of the two that shape personalities and decisions. Moomaw’s quick popularity stems from Nathan’s ability to recognize his customers’ inherent natures, and to nurture the environment around what each customer needs. 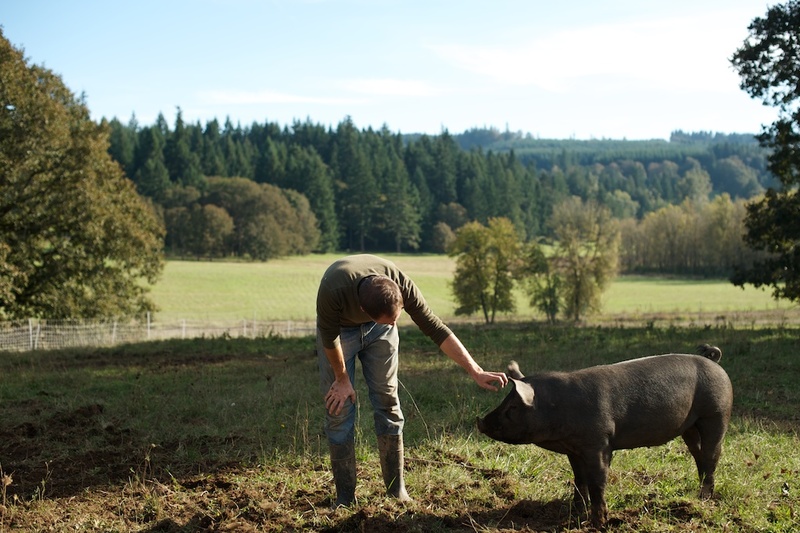 In fact, Nathan has nurtured his customer base in strikingly similar ways to how he nurtures his pastured animals. When I asked him about his customers, Nathan said that “a lot of people saw me and were like ‘oh, this is what I’d like to be buying!’ I presented [the CSA as having] the convenience of grocery store. A small quantity that I’ll bring right to your house.” Nathan elaborated, “Most of the time people want to do the right thing, but everyone is so busy that it’s not a practical reality.” While it’s human nature to try to make educated choices, there are numerous factors in our current environment that prevent us from doing so. Nathan removed many of these barriers, and suddenly, getting pastured meat became a simple proposition. 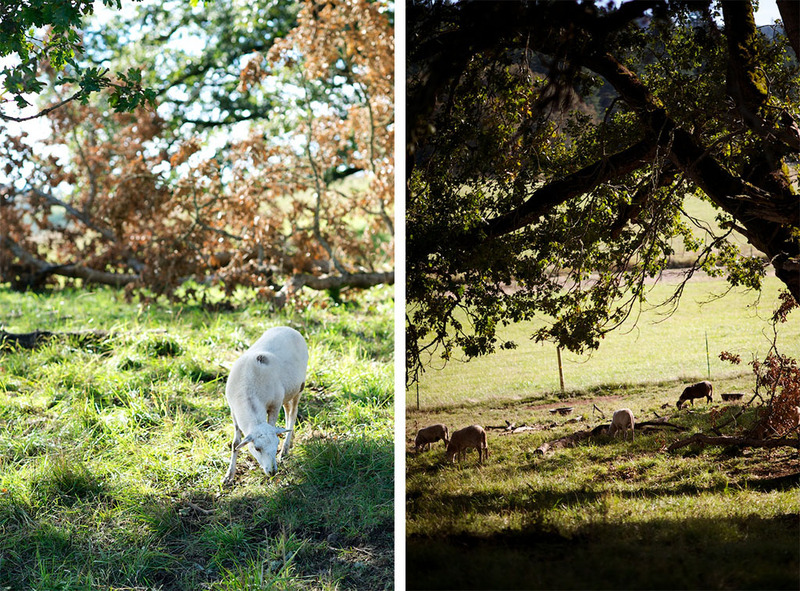 The relationship between nature and nurture is a daily part of running a pastured meat operation. It’s in an animal’s nature (unless it’s been entirely bred out of them) to want to be outside in the elements and forage for food. 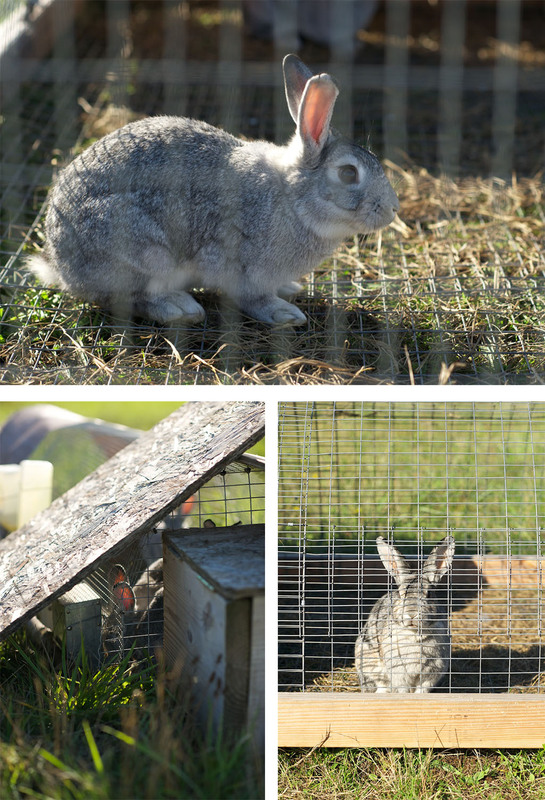 All of Moomaw Farm’s animals stay outside every day. They’ll seek shelter when it’s pouring or especially windy, but otherwise, these heritage breeds are meant to live with the elements, to exercise, and to move freely. 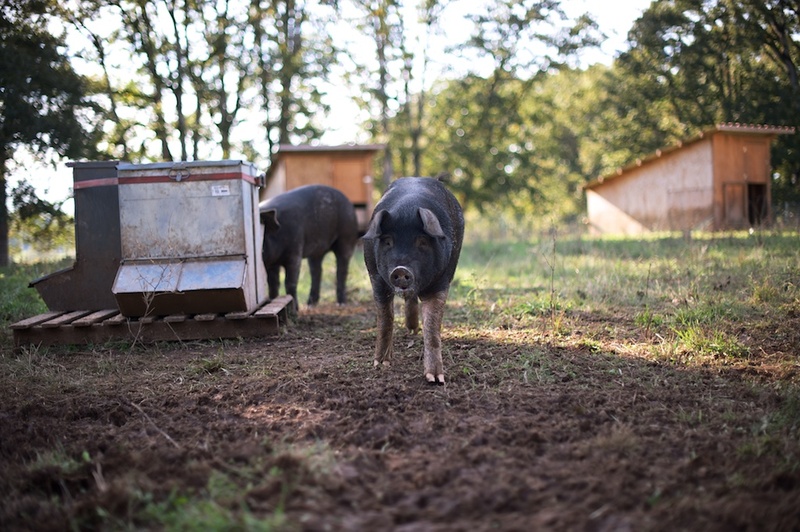 An animal will exhibit these traits, and as a result will be healthier and ultimately more flavorful when a farmer nurtures his animals in an appropriate environment like Nathan does at Moomaw Farm. Nathan manages this environment in numerous ways. 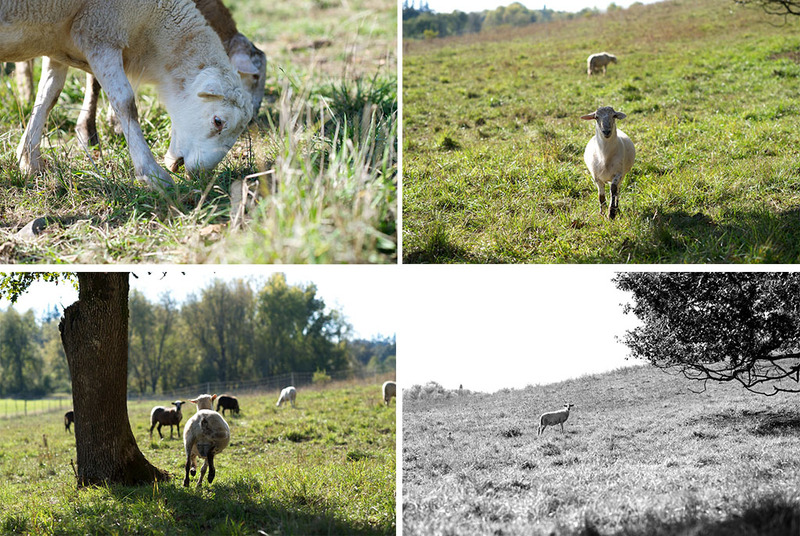 He rotates the animals to new pasture as necessary, which provides the animals with a variety of forage materials. The animals themselves interact daily with each other and with the farmer. And Nathan has designed systems that take care of the animals’ basic necessities, making water and shelter easily accessible. Despite the extent of agricultural animals’ shift from their original natural behaviors, the nurturing efforts of an attentive farmer, by carefully adjusting the environment and attentively addressing living conditions, can prompt a shift in these animals’ natural tendencies – and return an animal into a partial forager. Sometimes the results of this careful nurturing can be a surprise. When Nathan’s source of Red Ranger chickens “flaked out”, he was forced to experiment with a batch of Cornish Cross chickens. As he tells it, “I had a pretty decent experience with them. They did pretty well on pasture and I found that [though] their genes are pushing them to grow really fast, if you hold back their feed, you can really slow them down a lot. 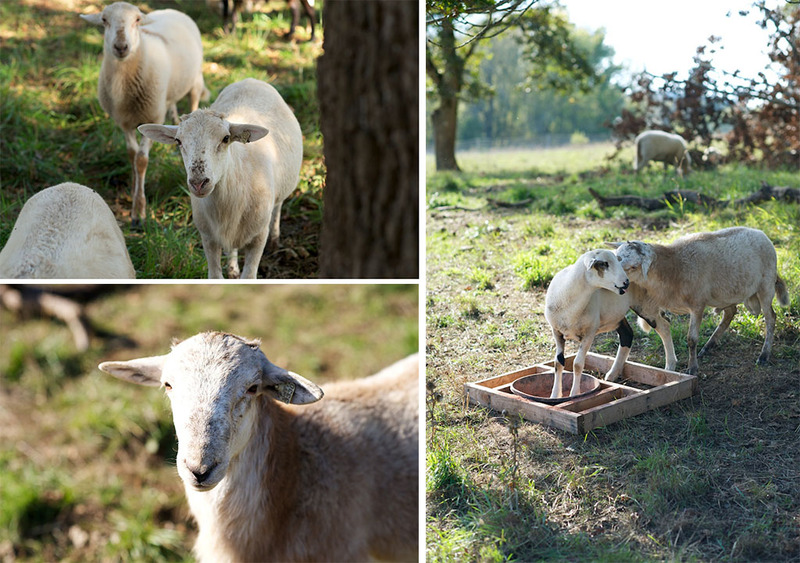 They’ll remain super active and won’t get organ failure and huge and lethargic.” Nathan was able to regulate their weight and re-stimulate natural instincts by laying out their feed in troughs, instead of gravity feeders. Once the birds had finished the food, they had no choice but to walk around and forage. 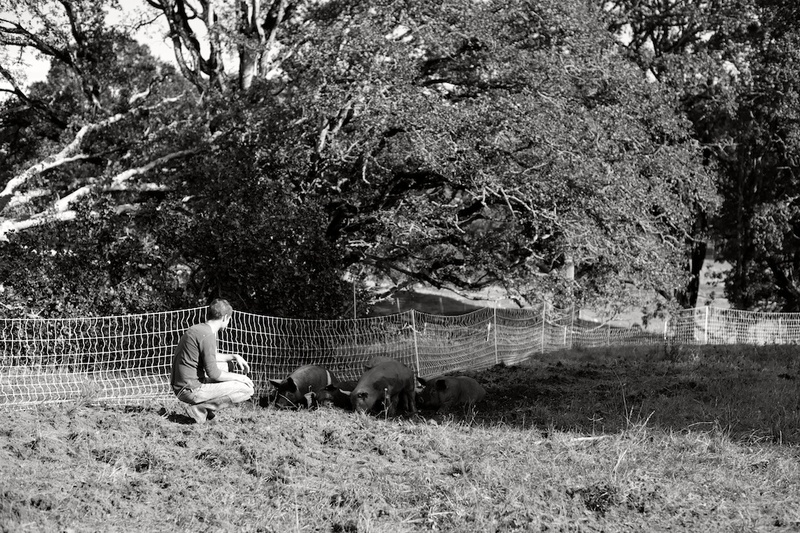 Nathan nurtures his animals to display these natural tendencies both for the animals’ benefit, and for the benefit of the soil and land he tends. An animal’s natural tendency to forage means that, depending on the animal, they will eat a variety of invasive plants, clean up seeds and acorns, and fertilize the land while eating. 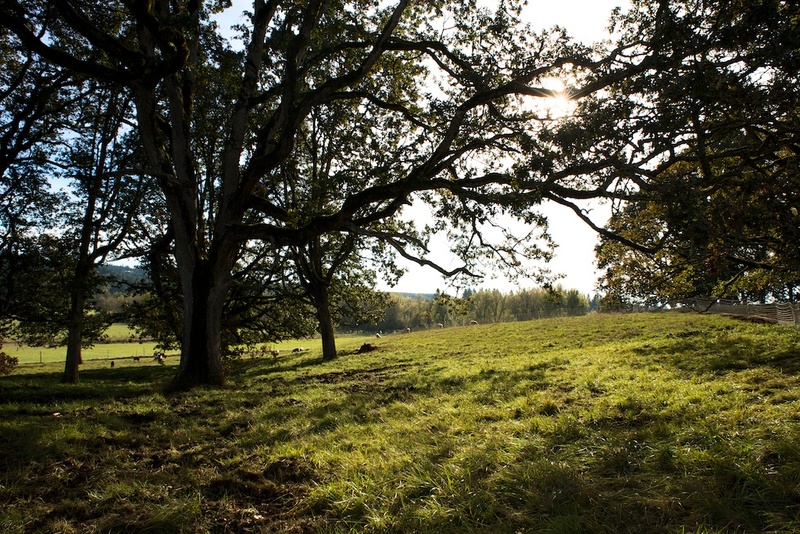 To nurture these tendencies in a productive way, Nathan sought land that would provide a variety of forage material and grazing environments. 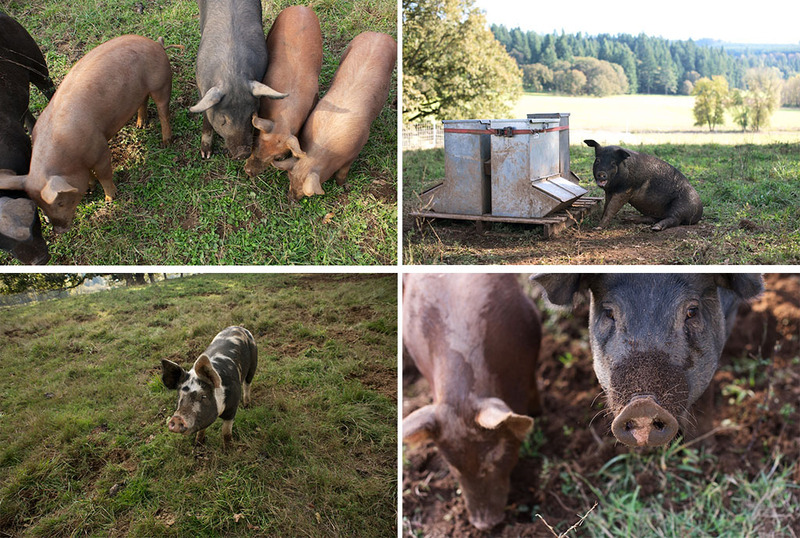 When managed properly, pastured animals aid in carbon and nitrogen sequestration, contribute to soil nutrient retention, encourage the growth of diverse grasses, and help prevent soil erosion. On a more global level, farms like Moomaw Family Farm can nurture change in an entire agricultural system through their interactions with the land, consumers, and with the numerous organizations with which they do business, from slaughterhouses to breeders to feed suppliers. During my visit, we talked at length about Nathan’s navigation of various slaughter and processing regulations, along with the dearth of small processors and the relative old age of experts in that field. He shared that the biggest gap in small scale livestock production is found at the processing stage. It requires a huge capital investment and high annual operating expenses to open – and continually operate – a USDA certified slaughterhouse and processing facility. Many of our nation’s processors and slaughterhouses have become vertically integrated into the larger system. Multinational businesses like Tyson control every stage of poultry production, from incubation to feed to processing, and thus a farmer contracted with Tyson must use their processing facilities. When farms like Moomaw Family Farm open, it increases the chance that these complicated, corporate controlled systems can change, whether they’re incentivizing more custom processing facilities to open or encouraging diversity in the animal feed sector. 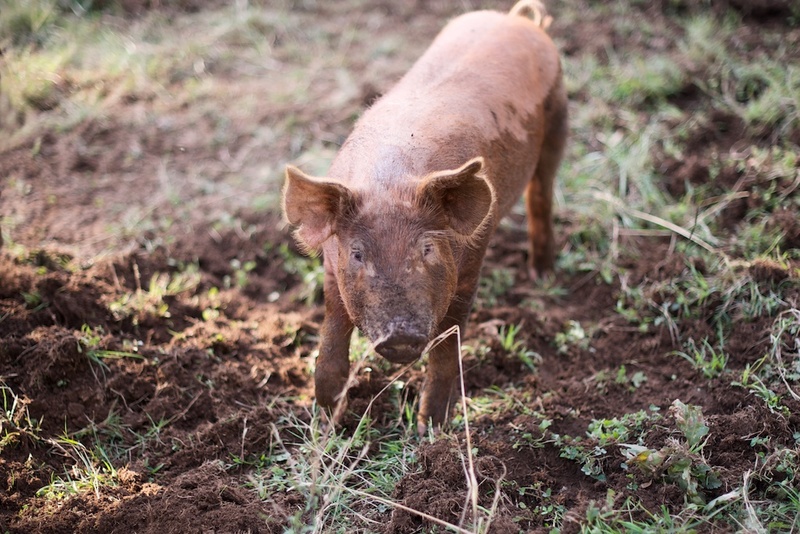 While Moomaw’s rabbits, lambs, pigs, and chickens forage for a large percentage of food, their diet still needs to be supplemented, especially the pigs’ and chickens’. Nathan buys feed from a local mill that mills their own feed, prioritizing this local source over the much more costly organic option because “[this feed] is not the only source of food” for the animals. By choosing to buy from a local mill 20 minutes down the road, Moomaw and other farmers have created enough demand to stimulate the mill into diversifying their grain options. “Now there are enough people like me who’ve been asking for non-GMO, locally grown grains [that the mill] is trying to do that now. 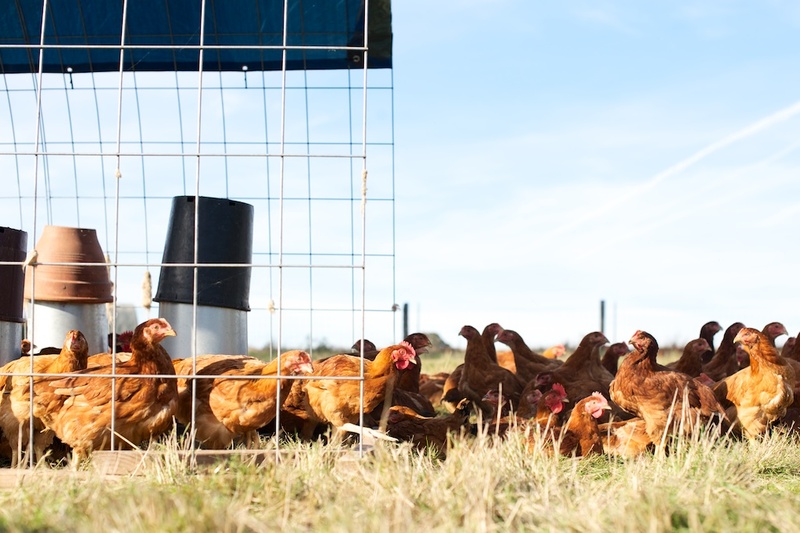 They just released a local, non-GMO layer mix for layer hens. 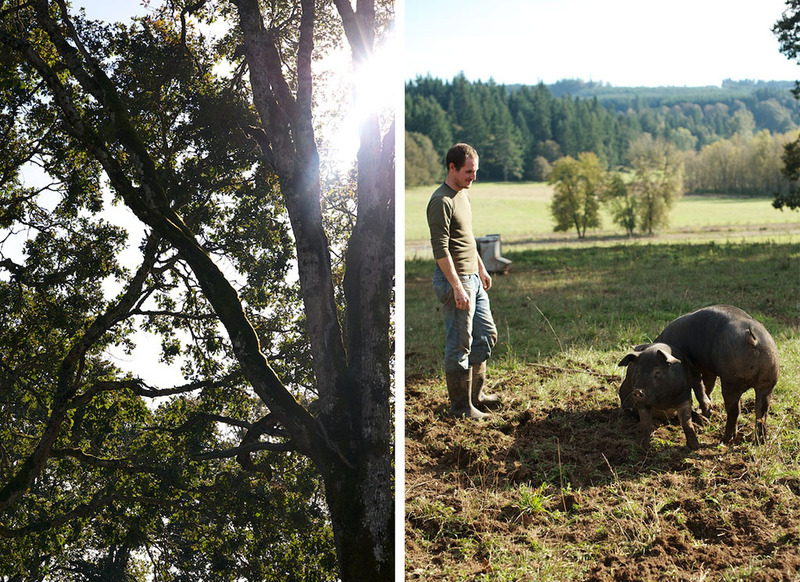 [Then] they’re going to try to a broiler mix and then a hog mix,” Nathan shared. Nathan’s customers are drawn to his sustainable meat CSA for reasons that echo national concerns about our food supply and health, reasons like food safety, freedom from corporate influence, antibiotic resistant bacteria, nutrition, and environmental impacts. There’s frequent discussion about the best way to empower people to eat in a more sustainable, aware way. Is it taste? Is it cost? It it accessibility? 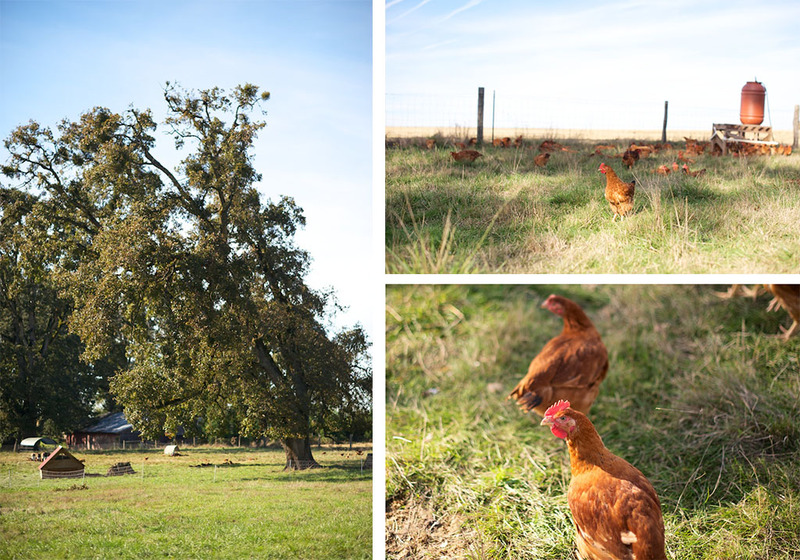 As Nathan and I stood in a pig pen looking out onto a massive oak tree, Nathan brought up France’s Label Rouge label, a poultry cooperative between farmers, processors, and distributors. 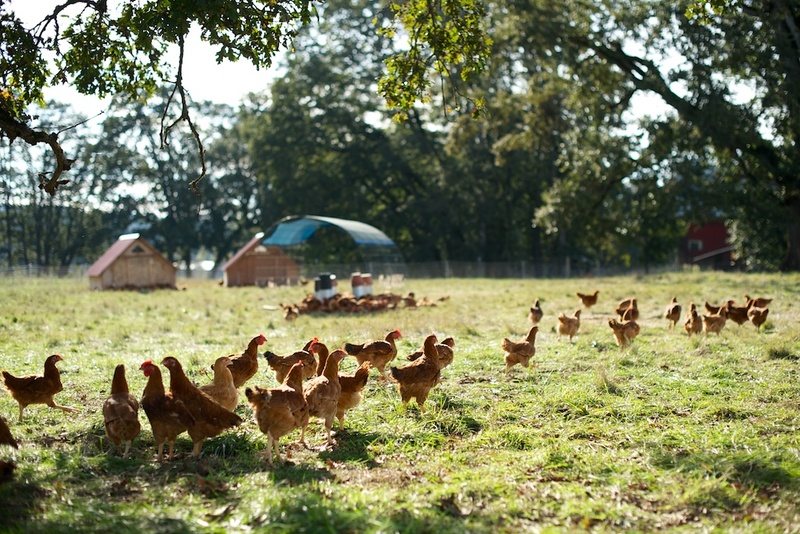 All members agree to certain standards, including that chickens are “pastured pastured”, as Nathan puts it, “not just given outdoor access”, designed to produce better tasting birds raised humanely. Forty years into Label Rouge’s existence, over 30% of chicken sold in France is from the Label Rouge system. As Nathan heads toward the quarter mark of his first season, he’s keeping most of his thoughts firmly on daily tasks and CSA logistics. 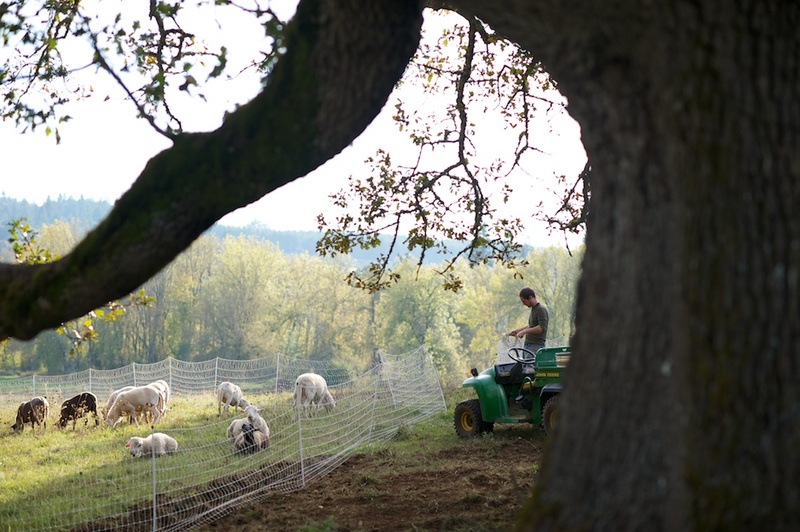 But it’s clear from our Label Rouge conversation that Nathan hopes that a similar system can evolve regionally in the United States: a pastured meat cooperative with exacting standards that can pool together to supply regional areas. I’m eager to defrost and braise the two lamb steaks I brought home from my visit. 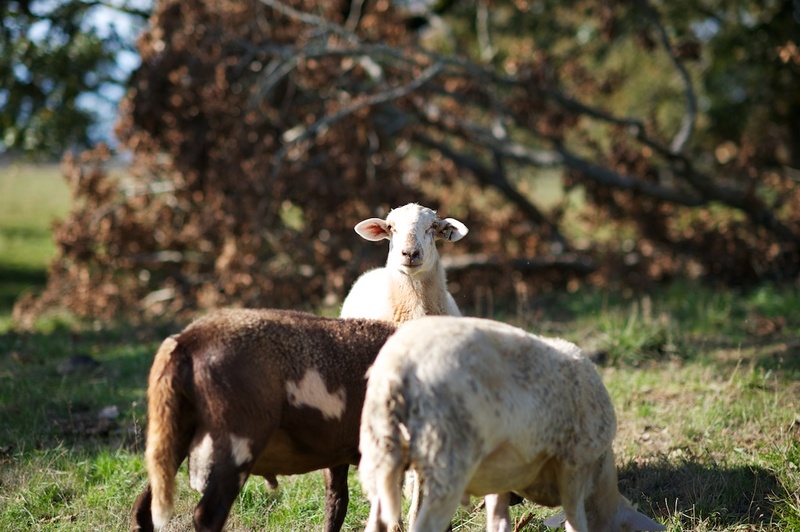 As I’ve written before, I’m selective about the meat I eat and, as it turns out, I’ve never eaten pastured heritage lamb. If Nathan does become one of the leaders in a regional system that provides ethical, accessible, and relatively affordable meat, then I anticipate that this won’t be the last time I open my freezer to find a cut of heritage pastured meat just begging to be defrosted. Spending time on a farm tends to lead to deep philosophical conversations about the nature of life and society. While early dusk settled across downtown Portland, the sun still shone brilliantly orange a mere fifteen minutes away, casting long and dappled light onto Sauvie Island.